4" Sludge Legs. Increases A dimension 3 1/2". Keeps Heated Section off Bottom of Tank. TLC & KTLC Series: Copper sheath heating elements for clean water. TLS & KTLS Series: Stainless steel sheath heating elements for mild corrosive solutions. 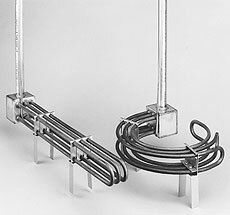 TLI & KTLI Series: Incoloy sheath heating elements for corrosive fluids. TLO & KTLO Series: Steel sheath heating elements for medium weight oils. Optional Thermostat Kits: Containing OMEGALUX™ AR-type thermostat and mounting hardware are available to fit in heater terminal box. Lightweight, portable, easy to install L-shape construction, puts the heat at the bottom of the tank and the terminal enclosure at the top of the tank. These heaters are convenient answers for many immersion heating applications. Capacities, dimensions and sheaths fit a wide range of heating applications. Easy to install and remove for cleaning with straight or circular element designs to fit many tank configurations. Construction: All wetted parts of these immersions heaters are made of the same metal or ally for optimum corrosion resistance. All gasketed terminal boxes are steel, coated with acid resistant paint finish. Corrosion Resistance: Wide choice of sheath materials should provide corrosion resistance in heating liquids. Check chemical composition of solution before selecting sheath material. Consult the Material selection Guide on pages Z-44 through Z-48. Sludge legs, or compatible metals, keep heated section off bottom of vessel, 4" standard height. Included with each heater (increases A Dimension by 31.2"). Sludge legs are standard on all heaters.